AirbrushQueen.com accepts and confirms Buyer's purchase order for the items, goods and products described in this Sales Policy. As a buyer you agree to terms and conditions of sales set forth below. No different or additional terms will be accepted by AirbrushQueen.com unless agreed in writing and signed by AirbrushQueen.com personnel. These terms and conditions are exclusive and in lieu of all other terms and conditions appearing on Buyer's purchase order or elsewhere and apply to all quotations made and orders accepted by AirbrushQueen.com. Unless specifically stated differently on this Sales Policy, AirbrushQueen.com is not responsible for typographical or clerical errors made in any quotations, orders or publications. All payments to AirbrushQueen.com must be in 100% full amount. No partial payments are accepted. If AirbrushQueen.com has to supply clothing material or items, there will be an additional fee for reimbursement. This can be discussed with an AirbrushQueen Representative once your Client Account has been registered. You as the buyer are responsible for sending us your clothing material for custom airbrush ordering. View Ordering Info for details. The ship date listed on the sales receipt will not reflect the date the payment is received. For each day a payment has not been received an additional day may be added to the ship date along with a late fee. View Late Fees for more details. AirbrushQueen.com is not responsible for monitoring payments. It is the customer’s responsibility to keep track of the date their product is due to ship. All payments must be received in the form of paypal, money orders, online bank transfer, wired money, cashier checks, cash, and credit cards. AirbrushQueen.com may refuse to airbrush any item unless payment in full amount is made whenever, in the sole discretion of AirbrushQueen.com there is doubt as to a Buyer's ability to pay. PayPal is the leading payment gateway for online purchases. AirbrushQueen is a longtime user of PayPal and if you are familiar with this payment service, you may certainly use it to complete payment for your order. You can use many different credit cards as well as use your own bank account to send money to many different countries in the world. For more information about PayPal, visit www.paypal.com for details. We do not accept cash at this time unless an appointment is scheduled with an AirbrushQueen.com representative. If you are located in the Houston Texas area, Contact us for more details. Prices and Shipping are subject to change at anytime depending on quantity and weight. The ship date indicated on your sales confirmation refers to the estimated time the product will be completed. International Shipping: Contact us at Info@AirbrushQueen.com for further details. AirbrushQueen.com shall ship the goods to the site specified on the Buyers account. Delay of payment on an order or the delay in receiving necessary (customer supplied) artwork will reflect a possible delay in the on-time completion of your entire order. 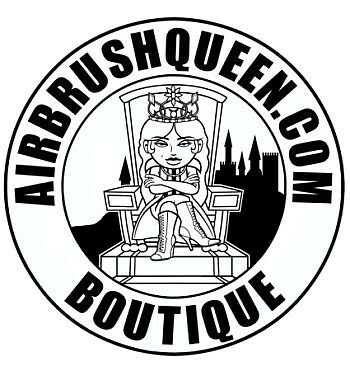 AirbrushQueen.com utilizes the services of several common carriers to handle the delivery of their products. Whenever possible AirbrushQueen.com will offer the discounts afforded to AirbrushQueen.com to the customer for their shipments through the specified carriers AirbrushQueen.com deals with. Unless a carrier is specified by customer, AirbrushQueen.com will use, at its discretion, its best way carrier to get the product to the customer. AirbrushQueen.com is not responsible for delays in shipping due to weather, union strikes, fires, floods, freight embargoes and acts of governments. Shipments requiring a lift gate style truck to unload AirbrushQueen.com items may be subject to additional shipping charges. Damages caused by shipper are not the responsibility of AirbrushQueen.com. Freight carriers Policies for handling of damaged goods during shipping must be followed to assure that claims are handled properly in the event that AirbrushQueen.com must collect back damaged shipment to repair. This will assure that AirbrushQueen.com is reimbursed for any expenses incurred in the repair of damaged goods. The promised delivery date is the estimated possible based on current and anticipated factory loads, of when the order will be shipped. AirbrushQueen.com shall not be liable for damage or for delay in delivery arising from causes beyond its control and without its fault or negligence including, but not limited to, destruction or damage to the goods. Under no circumstances shall AirbrushQueen.com be liable for any incidental, remote, speculative, consequential, punitive, reliance, delay, special damages, losses or expenses arising from this Sales Policy or AirbrushQueen.com or Buyer's performance or nonperformance, or any act or omissions of AirbrushQueen.com or in connection with the use of or inability to use the goods for any purpose whatsoever. In the event AirbrushQueen.com is found liable for damages not withstanding the limitations and exclusions contained in this section, AirbrushQueen.com shall not be responsible for damages to any person or entity, including, but not limited to buyer and Buyer's customers, for any amount exceeding the amount paid by the Buyer for the products ordered and confirmed by this Sales Policy. All charges are subject to the federal, state and local taxes if any. Customer shall pay such taxes imposed on any order, and all penalties and interest, if any, accrued therewith. All duty and or taxes owed for international orders will be paid by customer to custom authorities for their respectful country. AirbrushQueen.com disclaims any responsibility whatsoever to buyer or to any other person for injury to person or damage to or loss of property or value caused by any product which has been subjected to misuse, negligence, or accident, on any circumstances. All logos, product names, trademarks, artwork, literature, photographs and designs used for the purpose of producing AirbrushQueen.com products are proprietary and the sole property of AirbrushQueen.com. Any unauthorized reproduction of any of these items will constitute a copyright infringement and are punishable by law. AirbrushQueen.com makes no warranty that the goods will be delivered free of the rightful claim of any third party by way of infringement or the like. Buyer shall notify AirbrushQueen.com if making, using, or selling the goods that may result in the infringement of a patent or copyright. Breach of this contract by AirbrushQueen.com shall have no effect on the provisions controlling the risk of loss of the goods, and Section 2-510(1) and 2-510(2) of the Uniform Commercial Code shall have no effect on this Sales Policy. There are no representations, warranties or conditions, expressed or implied, statutory or otherwise except those herein contained, and no Sales Policy or waivers collateral here to shall be binding on either party unless in writing and signed by Buyer and accepted by AirbrushQueen.com. This Sales Policy contains all of the promises, warranties, terms and conditions of the Sales Policy between the parties and supersedes any and all oral or implied promises, undertakings and prior agreements. To the fullest extent permitted by applicable law, Buyer hereby irrevocably submits to the jurisdiction of any state or federal court located in the County of Houston, State of Texas, USA, over any action, suit or proceeding to enforce or defend any right under this Sales Policy, and Buyer hereby irrevocably agrees that all claims in respect of any such action or proceeding may be heard or determined in such state or federal court. To the fullest extent permitted by applicable law, buyer herby irrevocably waives the defense of any inconvenient forum to the maintenance of any such action or proceeding or any other substantive or procedural rights or remedies Buyer may have with respect to the maintenance of any such action or proceeding in any such form and Buyer herby agrees that a final judgment in any such action or proceeding shall be conclusive and may be enforced in any other jurisdiction by suit on the judgment or in any other manner provided by law. Buyer agrees not to institute any legal actions or proceedings against AirbrushQueen.com or any affiliate, arising out of or relating to this Sales Policy in any court other than as herein above specified. In the event either party brings an action to interpret or enforce its rights under this Sales Policy, the prevailing party shall be entitled to reasonable attorney's fees and costs which may be set by the court in the same action, in addition to any other relief to which it may be entitled. If any of the Terms or Conditions of this Sales Policy are found to be unenforceable, illegal or unconscionable by a court of competent jurisdiction, the remaining terms and conditions of this Sales Policy shall stay in full force and effect. All items are AirbrushQueen.com signatured upon buyers placement of choice. No item will be authorized or accepted unless buyer agrees to the following statement. AirbrushQueen.com reserves the right to refuse service to anyone at anytime. Our registration process requires only a valid e-mail address, postal mail address, and a unique user ID and password. Providing us with other information is at your option. Please take note that your user name, e-mail address, or other submissions that you make on AirbrushQueen.com may contain your real name or other personally identifiable information and, as a result, may appear on AirbrushQueen.com. Like many web sites, we may also automatically receive general information that is contained in our server log files such as your IP address and cookie information. Information about how advertising may be served on AirbrushQueen.com (if at all) is set forth below. AirbrushQueen.com may make changes to this Policy from time to time. AirbrushQueen.com will notify you of substantial changes to this Policy either by posting a prominent announcement on AirbrushQueen.com and/or by sending a message to the e-mail address you have provided to us that is contained within your user settings.